Noise pollution is the leading cause of hearing problems in all countries throughout the world. People working in noisy environments face the greatest risk of losing their hearing abilities as they are constantly exposed to loud and deafening noises. 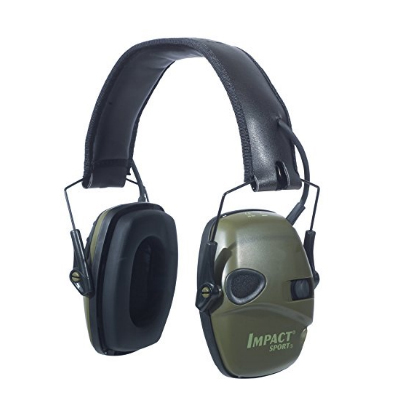 People in the construction industry and those who frequently handle firearms at the shooting range or when hunting understand the significance of wearing ear proctors to protect their ears from the harmful consequences of loud noises. On a similar note, you should make a point of wearing protective gear before heading out to the shooting range or to hunt. Below, we diligently walk you through the steps of choosing a most suitable ear protector to keep you safe as you work or have fun. All ear protectors come with a Noise Reduction Rating that must be confirmed by relevant authorities, such as the U.S. Environmental Protection Agency in the United States, before they are released for public use. Products with a lower NRR rating could expose you to loud noises that can adversely affect your hearing. 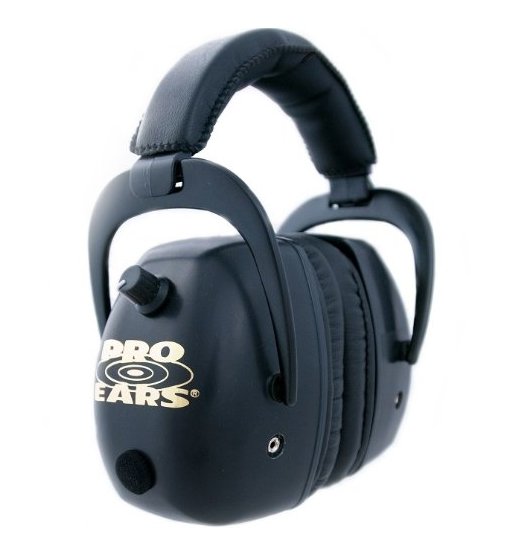 Noisy environments synonymous with loud noises such as the shooting range or a construction site necessitate the use of high-quality ear protective gear to block out any loud noises. Constant exposure to noises louder than 140 decibels drastically reduces the sensitivity of your ears with time. Different manufacturers offer different ear protectors with vastly different capabilities, some capable of reducing massive blasts of more than 140 to just 40 decibels. Consequently, bearing in mind the health repercussions, you need to pay a lot of attention to the NRR rating of the ear protector you intend to purchase. There are substantial differences in ear protectors when it comes to the level of comfort they offer. Ear protectors with a lightweight and compact design are easy to carry around can be comfortably worn over the head without causing the user any discomforts whatsoever. Their lightweight design also means you can store them conveniently without taking up too much storage space in your backpack or bag. Heavily padded ear protectors create a perfect seal around the ears thereby completely blocking off all types of undesirable noises leaving only the most ambient ones to filter through. The ease with which ear cups are able to contour around the ears is also another factor affecting comfortability. Similarly, ear protectors with adjustable headbands can comfortably accommodate different head sizes while offering maximum protection against loud sounds. When searching for ear protectors, you should note that design and aesthetics do not mean the same thing. The design is a reference to the functionality of a given tool. A properly designed tool enables you to blend with relative ease into your immediate surrounding and gives you the feeling that the tool is a natural extension of your own body. For people intending to use ear protectors on a hunting escapade, colors should play an important role in your decision so that you don’t give away your position. You may want to look out for waterproof ear protectors depending on the environment you intend to use the ear protectors. Affordability is obviously a paramount factor when looking to buy an ear protector, especially considering that while ear protectors may be differently prized, there may be no significant differences in their performance. Top model ear protectors come with premium price tags which could be a reflection of its performance and durability. It is also a general rule that costly products offer reliability irrespective of the working conditions to which they are exposed and are more comfortable to allow for several hours of use. The Honeywell brand is renowned for producing products synonymous with excellent noise reducing capabilities, as demonstrated by the Howard Leight Impact Sports Sound, which can reduce noise to comfortable levels of just 82 decibels. A decibel range of 82 Db poses to real danger to one's ears, and so the ears are safe. The Howard Leight Impact Sports Sound is specifically targeted at firearm users and construction workers, and its design and features aim to keep the user as safe as possible while using firearms either for shooting or doing construction works. The headset features a low profile design, allowing for the perfect fitting of the stock around the ears. Because the ear protectors can be adjusted with relative ease, it can nicely fit a broad range of head sizes, irrespective of whether it is a child's or a grown-up's. The lightweight and compact design of the headband, together with its easy foldable feature ensures it takes up the least amount of storage space and subsequently, can be transported from one place to another with relative ease. The directional microphones have voice amplifying abilities and will be of great assistance while you are out hunting with other people. The directional microphones are so effective that you will be able to distinctly hear commands or instructions being relayed to you should you find yourself in tactical circumstances. It has Noise Reduction Rating of 22 decibels, which, while it is a considerably average value, is available irrespective of the configuration of the electronic ear protection feature. The implication is that when the on setting is activated, all ambient sounds going through the microphone will be amplified to an astounding 82 decibel level of noise. However, the settings do not apply to sounds louder than 82 decibels, which would result in the immediate cutting off of amplification. The main difference between the headset and other ear protectors is that it comes with an Air Flow Control feature, allowing the ear protector to have slimly designed earcups. The advantage of this feature is that it enables you to experience exceptional comfort while using your firearm. The headset is powered by two AAA batteries capable of lasting for approximately 350 hours before requiring a replacement pair. Additionally, the ear protector will automatically shut itself off following four hours of nonstop use or when accidentally left on. 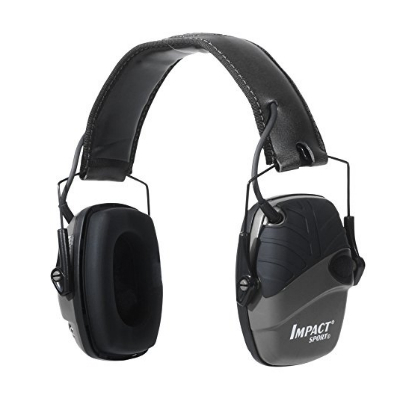 If you are an ardent shooter or work on loud constructionn grounds looking for a reliable, top-performing, and solidly constructed ear protector, look no further than the Howard Leight by Honeywell Impact Pro Electromagnetic Earmuff. This ear protector comes equipped with very convenient microphones capable of amplifying all types of ambient sounds to just 82 decibels, which is safe enough for your ears. Consequently, you will always be conversant with all the going-on around you, whether you at the range shooting fire arms or out with friends hunting. The beauty of it is that it has microphones that will automatically cancel out any noises louder than 82 decibels within your nearest vicinity. The ear protector is also designed to passively block 30 decibels of noise in the event that electronic ear protection feature is off. Consequently, you have an ear protector that offers you exceptional performance and protection whether the electronic ear protection is turned off or on. It has a Noise Reduction Rating of 30 decibels. This means the headset offers above average performance in protecting your ear against the dangerous consequences of loud noises produced during hunting, shooting, or at the construction site. Apart from canceling out loud environmental noises, it does a wonderful job amplifying ambient sounds such as voices of the people around you. Amplification comes in handy when you need to communicate with the people around you, be it at the range or in thick forest. It is particularly important when there is a need to relay particularly important tactical information without having to take off your ear protector. Consequently, the amplification feature allows you to participate in conversations with the people around you. The amplification feature is so sensitive that you will be able to hear people whisper or animals break sticks without even straining. It features a sturdy and robust construction to ensure it last for several years with proper use. The model has several pressure points, all of which are made from rubber to give it additional protection against scratches. You will not experience even the slightest of difficulties wearing the ear protector as it is equipped with padded and adjustable headband making it fit comfortably and securely on both small and big heads alike. Music lovers will probably be thrilled by the fact that the ear protectors has a 3.5mm audio jack connector allowing you to listen to your favourite music as you do your thing. You can describe the ClearArmor 141001 Safety Ear Muffs with just three words: comfortable, cost-effective, and very durable. To prove just how comfortable the headset is, the design allows you to adjust the headband from both sides without breaking, making it possible to fit onto various head sizes, whether it is a small, medium, or big. Additional padding on the headband with synthetic leather ensures enhanced comfort while also giving you an easy time when it comes to getting the headset clean after a hard day's use at the range, construction site, and garage or in the wild. They feature a Snug Fit design that ensures it fits comfortably yet firmly on your head irrespective of the intensity of your work or the position you are assuming. As a result, you do not have to worry about the ear protector coming off and exposing your ears to loud noises when bend over or start sweating profusely. Also, storing the it is quite easy as all you have to do is fold them up. The manufacturer uses two layers of noise reducing foam to make the cups. Additionally, the tilting and swiveling of the cups allow them to fit perfectly into one's head. The softness and comfortability of the cushions allow for the creation of a perfect seal all around your ears, thus blocking out all noises. They come with Noise Reduction Rating of 31 decibels, which is way above average and consistent with its top model status. With an NRR of 31 decibels, they work perfectly and exceptionally well in canceling out unwanted noise. 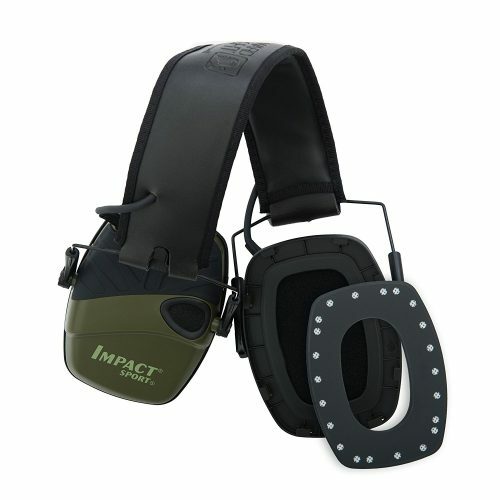 The ear protector is, therefore, a must-have tool whenever you are going to the range or hunting with friends. To make the ear protector even more versatile, the manufacturer provides warranty and a 90-day money back guarantee. Despite being a budget pick, the set is solidly constructed using durable and lightweight materials such as plastic that pairs perfectly with its flawless performance. The benefit to using plastic is two-fold. Other than keeping the overall weight of the whole tool down, it also considerably extends the shelf-life of the tool, giving you several years of reliable and dependable service without having to break the bank. Also, all the components of the tool are screwed together instead of being glued, as is the case with most ear protectors on the market today. Therefore, it not only meets but also exceeds the American National Standards Institute and European Standards. Snug Safe n Sound Kids Earmuffs provide children above the age of six months with the best protection against loud noises and disturbances produced at various settings. They perfectly eliminate loud noises coming from large crowds, heavy machinery, airports, shooting ranges, among other events and places. 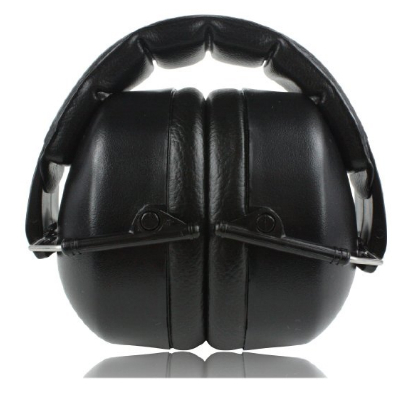 The main factor that separates the Snug Safe n Sound earmuffs from other ear protectors is their superior build quality, which ensures they are strong and sturdy, and therefore increasing their shelf-life by several years. Similarly, their lightweight and compact design make them quite easy to store and transport from one location to another. They are quite comfortable, adjustable, and easy to use. The headband, for instance, has a cushion lining that smoothly rubs on the ear to ensure a comfortable and perfect fit. Additionally, the earpieces are capable of revolving around the metal break, which is a clear demonstration of the headset’s ability to exquisitely fit into small, medium and big-sized heads with exceptional ease. 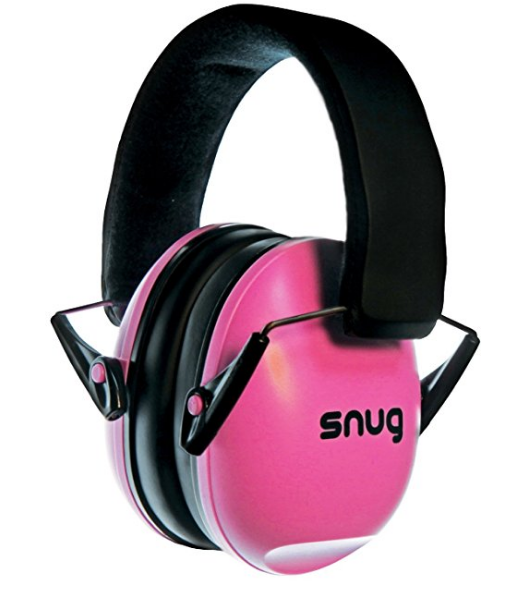 The Snug Safe n Sound earmuffs feature a low profile design, allowing for the perfect fitting of the stock around the ears, ensuring the ears are covered firmly. With the Snug Safe n Sound earmuffs, you can bring along your kids or other children to the range or on hunting escapades without worrying about exposing their young ears to injurious noises. The Professional Safety Ear Muffs is a product from Decibel Defense and is maximized for protecting your hearing against any dangerously high noise. The ear protectors are professionally built and have the ability to impressively reduce noise levels by 34 – 37 decibels, a fete that very few ear protectors on the market today are capable of achieving. With such astounding noise reducing rating technology with an impressive score of 37 decibels, they come with a professionally padded headband to prevent your ears from hurting even after several hours of consecutive use in a noisy environment. The features that set the headset apart from its closest competitors is the fact that it comes with additional padding on the headband, which you would think compromises its performance. Nevertheless, the set features a lightweight and foldable design, which, when coupled with its high adjustability, makes it quite flexible and therefore usable by both children and grownups too. The powerful performance and versatility are further demonstrated by the fact that they not only receive high ratings but also because they are comfortable and capable of totally reducing external sounds. Their design and high-quality construction make them ideal for a wide range of uses including shooting and performing construction work activities. Consequently, they can be used by musicians and other professionals working in noisy environments. The comfortability of the headset's headband gives you a comfortable feeling and can encourage you to continue working on a project for an extended period without having to worry about the safety of your hearing. Furthermore, the set is as compact as it is lightweight, making it the easiest to fold and store securely in a bag. The lightweight design furthermore ensures it has unprecedented ease of portability so you can move it from one place to another with relative ease. 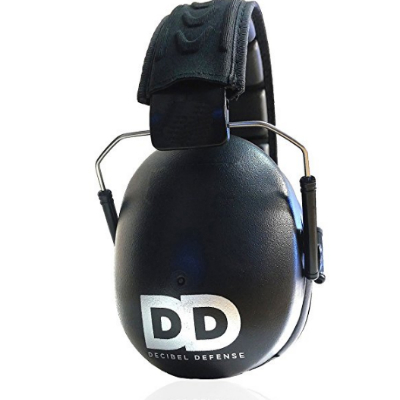 In all, the Professional Safety Ear Muffs by Decibel Defense is constructed to ensure your security and safety while not compromising on comfortability and performance. The headset ensures your hearing is protected from loud and uncomfortable noises synonymous with construction sites, hunting, and shooting firearms. If you are in search for an ear protector that perfectly combines usability and safety, you need to give serious consideration to the Walker's Game Ear Razor Slim Electronic Muff. The ear protector is equipped with a useful noise cancelling system which self-activates the second noises around you exceed 85 decibels. The set has a Noise Reducing Rating of 23 decibels, implying that shattering noises of about 100 decibels will be promptly reduced to safe levels of between 77 and 78 decibels. The convenience of the active noise reducing system is informed by its quick reaction duration of just 0.02 seconds. Consequently, you can safely use the ear protector in various loud environments including construction sites and the firing range. This is undeniable one of the easiest to use ear protectors on the market today. Activating the noise cancellation feature, for instance, only requires simply turning a knob conveniently located on the left cup. The entire process takes less than five seconds and is quite straight forward. Turning the knob clockwise or counter clockwise also controls the volume of the speakers. As a result, you have the freedom of adjusting it in line with your preferences and circumstances. The feature effectively keeps you in touch with your environment, amplifying the sounds made by animals in your vicinity for a better hunting experience, without the need to take off the ear protector. The set has a lightweight and compact design, having been made from ultra-light and ultra-strong materials. It is possible to make adjustments to the lengths of the headband and soft padding, making this ear protector even more convenient. The lightweight design also makes storage quite easy, saving you a lot of storage space. Because the cushioned cups and headband are connected through wire hinges, it takes very little effort to collapse the cups downwards, so they occupy less storage space in your backpack or bag. Also, the design of the paddings allows them to press firmly but tenderly on the ears creating a perfect seal that cannot be broken by running. One attractive feature of the headset is its ability to passively reduce noises to comfortable levels even after the battery has drained out. And that is not all! The ear protector comes with a 3.5mm audio jack to allow you listen to your favourite music on the go. 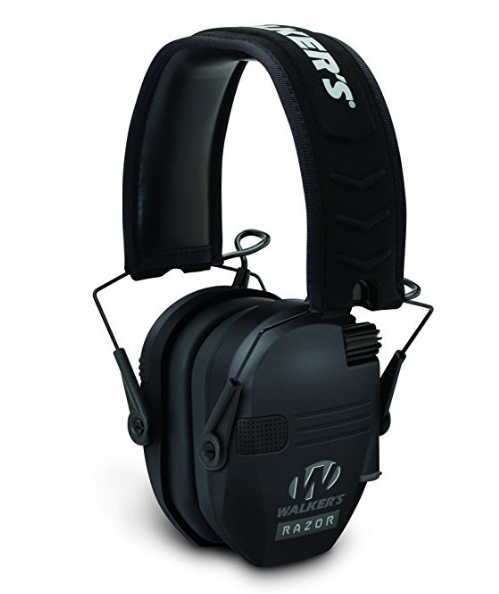 In all, the Walker’s Game Ear Razor muff is ideal for a wide range of applications. You can safely use the set at the shooting range, on the construction site, for hunting among other activities without ever worrying about damaging your ears. Individuals looking for a lightweight, compact and versatile ear protector should look no further than the Peltor Sports Tactical 100 Electromagnetic Hearing Protector. The ear protector comes equipped with a noise reducing technology that effectively minimizes powerful and dangerous noises from causing any harm to the ear, especially noises from gunshots. Similarly, the headset amplifies low-level ambient sounds like the voices of the people around you, so you are always in communication able to receive instructions or tactical information. The headset's perfect amplification abilities make it an ideal ear protector to wear when doing loud and noisy activities both within and outside the house or construction site. A particularly interesting feature is its Adaptive Frequency Response technology that is capable of reducing background noises thereby effectively making exchanges between users a lot clearer. The feature significantly increases the relay of important tactical information between two or more people in a critical situation. Additionally, the set comes with a Variable Suppression Time that functions by considerably reducing, or eliminating, in some circumstances, echoes in indoor settings. As a result, this option is perfect to use in a wide range of situations irrespective of the nature of the surroundings. It stands at 22 decibels, which, while it is considered an average performance, does a perfect job reducing noise to safer levels to keep your hearing ability intact. 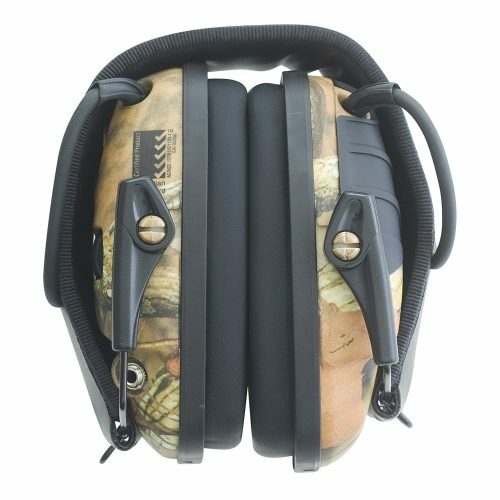 Furthermore, the ear protector can decrease wind noise as it is equipped with low-profile microphones, making it possible to use the headset under different circumstances, whether it is hunting, welding, construction, or firearm shooting. The construction of the ear protector from lightweight materials makes the ear plugs notably lighter and capable of fitting nicely and firmly on different head sizes. The ear protectors come with two AAA batteries provide the ear protectors with adequate power making it possible for you to listen to your favourite songs at the range or while hunting. 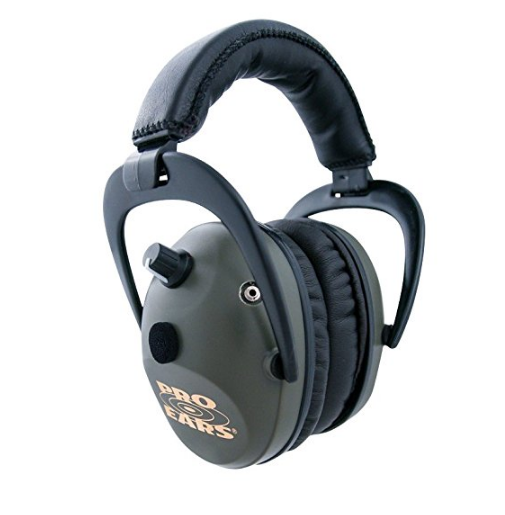 The Pro Ears Predator should be part and parcel of your toolbox whether you are planning on going to the shooting range, hunting, to the construction site, or welding. Unlike electronic ear protectors such as the Pro Ears Predator, foam and passive earplugs do eliminate all types of noises from reaching your ear, meaning that you lose touch with the activities going on around you. These earmuffs, on the other hand, do an amazing job reducing muzzle blast while allowing you to hear the voices of those around you, which is crucial for receiving tactical information in critical times. The secret to the success of the ear protectors is that they go beyond just diminishing harmful noises to safe levels. They also compress the sounds, which results in a smooth, dependable sound allowing you to clearly and wholly participate in conversations with the people surrounding you. Cranking up the volume really allows you to hear even the faintest sounds like the crunching of leaves. They come with hybrid analog and digital system that reduces the delay time to just 0,015 seconds. Furthermore, the headset helps you conserve energy by automatically shutting itself off after hours of use. Additionally, there is a 3.5mm jack port to enable you to listen to your audio music in-between tasks without getting bored. The low profile design of the ear protector's cups allows for them to fit perfectly on the ears so you can use the headset for hours on end without experiencing any significant discomfort. 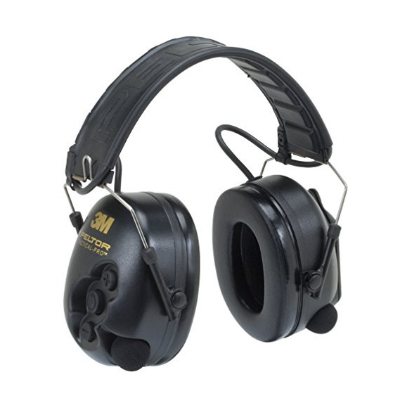 If you are an individual who regularly participates in activities or hobbies requiring the use of ear safety gear and in search of an ear protector to keep your hearing safe, you should pay serious attention to the Pro For Show 34dB earmuffs. The headset has a reputation for offering effective noise reduction rate by effortlessly absorbing the disturbing and harmful noises produced by large-calibre firearms and loud tools. It is worth noting that a large majority of Pro For Show’s close rivals do not pass such tests. Other than noise reduction, the other main selling point is weight. The headset is considerably lighter and more compact than those offered by other brands. The ear muffs are built with the use of industrial-strength and scratch-resistant plastic and feature a design that aims at overcoming common drawbacks plaguing most earmuffs. The manufacturer apparently invested a lot of resources into creating a balance between weight, reliability, and utmost performance. With an approximate weight of just 7 ounces, the earmuffs will not cause you any discomfort in or around the ears even prolonged hours of consistent use. The ear protectors come with an exquisite ergonomic design and greatly increases comfort and ease of use, giving you the feeling that the headset is a natural extension of your own body. Furthermore, they are conveniently equipped with a padded headband to ensure that it fits firmly and comfortably into heads of different sizes, both adults and children’s. It is a scientific fact that noises louder than 80 decibels can have adverse negative repercussions not only to your ears but also to your general health, making you stressful by increasing systolic blood pressure. Excessively loud noises will, over time, force your ears to adapt thereby leading to a significant drop in their levels of sensitivity. With this information in mind, it is now easy to appreciate the importance of always using ear protecting gear whenever you are in a noisy environment. Hence, the earmuffs are ideal for studying, woodworking, as well as shooting guns at the range with friends. The Pro For Sho 34dB come with a Noise Reduction Rating of 34 decibels, which is quite impressive considering its price tag. 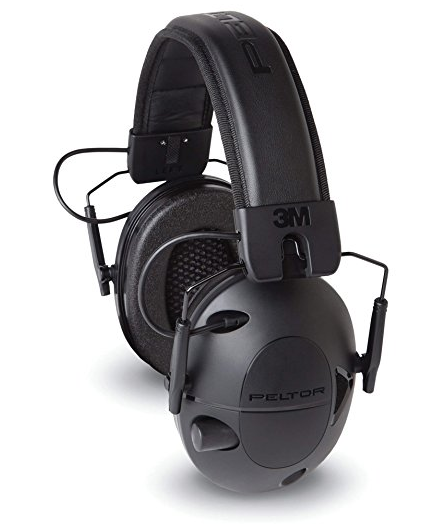 One of the best ear protectors worth your attention and time is the Peltor TacticalPro manufactured by the 3M brand. The ear protectors are capable of amplifying low-levels sounds as well as giving you additional protection against the harmful consequences of impulse noises. The Peltor TacticalPro ear protectors come with a Noise Reduction Rating (NRR) technology with a 26 decibel (dB) rating. The admirable feature is its ability to protect your hearing from the devastating consequences of loud noises such as those occasioned by shooting while allowing you to hear and recognize voices in a noisy environment. In other words, the set effectively filters out undesirable noises allowing in only those that are friendly to your ears. Additionally, it is similarly compatible with several models of portable radios, thus making it a versatile and flexible ear protector to use in giving your hearing that additional protection. The headset has a deep ear cup design that ensures comfortability, thereby making it appropriate for daily use without having to worry about your ears hurting. Furthermore, the ear protectors come with very useful cushions for the same purpose, so you will not experience any levels of discomfort while using them. The 3M brand put a lot of thought into designing the headband, making sure it does not put an unnecessarily high amount of pressure on the user's temple. Also, while using the headset, you are not cut off from the world around you in any way. The headband comes with cup microphones capable of listening to ambient sounds and voices through a full 360-degrees. Consequences, you will always be in touch with the activities taking place around you at all times. Using the headset is quite a straightforward and easy endeavour. All you have to do to control the headset is use the included touchpad. The touchpad comes with three buttons and features an ergonomic design to ensure ease of use. Pressing and holding down the middle button makes it possible for you to hear all ambient sounds around you with exceptional ease, eliminating the need to strain, as is the case with some ear protectors. The headband is tightly sealed with the help of gel cups, which are additionally quite comfortable. Lastly, the ear protectors have an input jack allowing for a connection between the headset and a portable audio or communications device. Considering all the features of the 3M Peltor TacticalPro Communications headset, it is easy to see why it is considered one of the best ear protectors on the market today. Construction employees are exposed to potentially harmful noise every day on a job site. Any sound exceeding 85 decibels can cause noise-induced hearing loss. The Occupational Safety and Health Administration (OSHA) standards require workers exposed to loud noises to use ear protectors. Therefore, employers are required to devise a hearing conservation program. This program is purposely prepared for staffs that are exposed to a noise level of 85 decibels for eight hours in a work day. How does the program work? Monitoring the level of noise on a job site is always the first phase of an effective program. It involves identifying the workers exposed to sound levels of more than 85 decibels. It also entails determining specific equipment and tools that produce the noise. The tools may include jackhammers, saws, forklifts, heavy equipment, etc. Replacing all outdated equipment that produces much noise with new equipment that features built-in noise dampening substances. Lubricating and maintaining all equipment since worn out parts can produce a loud noise. Building a temporary noise barrier, for instance, placing plywood on a generator and put a fire-resistant material in the box. Move tools such as saws to a secluded area to distance the machine from the rest of the workers. Run noisy equipment where there are fewer employees on the construction site. Rotate the workers so that particular workers are not always exposed to high noise levels. 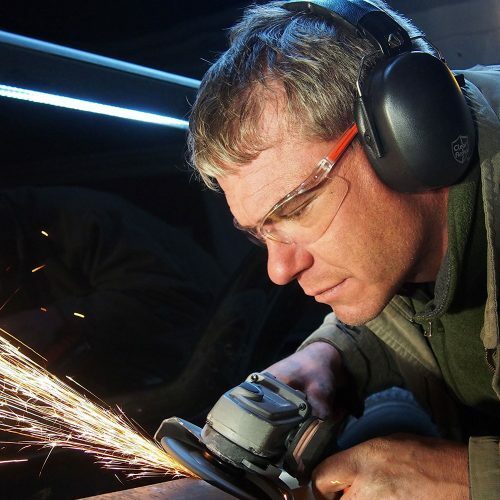 Q: How do I protect my hearing while handling tools which produce loud noises? A: Protecting your hearing and safety should be your first concern whenever you are handling a tool which produces potentially harmful noises. That being said, there are a variety of measures you can take to keep yourself and your friends safe such as wearing proper protections throughout the process. You can use ear plugs, foam plugs or earmuffs to ensure you do not gradually lose hearing sensitive with following the consistent use of loud tools. Q: What factors should I consider before purchasing ear protectors? A: There exists a wide range of factors to pay close attention to when deciding on the most suitable ear protector for any given activity, the most important of which is noise reduction rating (NRR). Since measure how effective a set of ear protectors can keep your ears safe from extremely loud noises, a higher rating means better protection compared to a lower rating, obviously. Similarly, you should never compromise on performance and comfort. Comfortable ear protectors should be devoid of any unnecessary pressure that could make the set uncomfortable after a few hours of use. Neither should you overlook affordability, aesthetics, and design. Q: How do I ensure my ear protectors fit me perfectly? A: It is important that your ear protectors fit you firmly so as to create a perfect seal. To achieve this, you will have to adjust the length of the headbands until you have the desirable perfect fit. Most ear protectors with the adjustable headbands should be able to fit perfectly without you having to struggle too much as they are meant for different head sizes. When it comes to choosing the most suitable ear protector to keep your ears safe from the damaging and harmful consequences of loud noises, you have several brands and ear protectors to choose from. With this in mind, you need to exercise a lot of caution, so you do end up with a poorly constructed ear protector. It would be a shame to lose your hearing a time when the market is flooded with very functional and reasonably priced ear protectors.